So, I'm writing a scene where my main character, a 16-year-old girl, gets grounded by her grandmother for using foul language in the sampler she's supposed to be stitching. 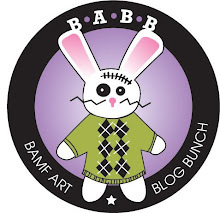 I wanted her naughty sampler to be more witty than just a simple curse or telling off, so I did some internet searches on a whim for foul-mouthed stitchery. 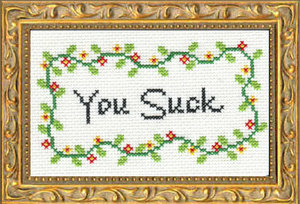 Believe it or not, I found a site that actually sells foul-mouthed needlepoint kits: http://www.subversivecrossstitch.com. I have two sampler-type pillows I received as gifts: one says, My Family Tree is Full of Nuts, and the other says I Smile Because You're My Sister; I Laugh Because You Can't Do Anything About It. Pretty fitting, really. I've always liked "My mother is the travel agent for one-way guilt trips." A bit long for stitching is "Thousands of years ago cats were worshipped as gods. They have not forgotten this." Don't need that one at my house--we live it! I don't have one, but I've always liked "Dogs have owners, cats have staff." 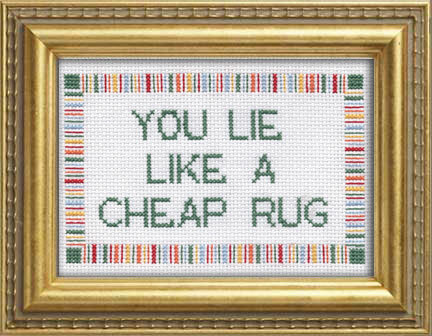 there are OH SO MANY rude things I would love to see on a sampler, but then, I am kinda bitchy lately.. and I totally haunt subversive crosstitch when I am feeling particularly stabby. Somehow just looking at her hard work, makes me feel better. "Pleased to meet you, it's a pleasure knowing me."